Hairstyling is an easy and quick way to get the desired look. And it’s actually the best way to look good. According to some study, it also shows that the average woman changes their hairstyle 36 times during her lifetime by using hair straighteners, blow dryers, curling irons or any. The most important question arises that are these tools make your hair problems go away or they increase it. What happens when you use heat styling tools? Your hair contains keratin proteins and hydrogen bonds. They are actually responsible for making your hair frizzy, curly or thick. When you use any heat styling tools, these will remove the natural oils and proteins from hair by breaking its hydrogen bonds. This heat changes your hair texture in order to achieve straightness, curliness or sleekness. When you started using regularly heat styling then it forms an irregular texture and strands which are more prone to breakage and causes hair loss. Initially, these tools help to achieve the fabulous look but routinely can really weak your hair, especially if you have natural dry or colored hair. So you should be mindful when using heat styling tools. How Hairstyles tools Cause Hair Loss? When you put your hair in a variety of hairstyles tools that cause the hair to be pulled, which increase the risk of losing hair gradually as it goes on without knowing it. Hair loss can be stopped if you carefully choose your hairstyle tools. Everyone hair is different so before purchasing any tools you have to look the adjustments and setting on it. Basic feature tools will not provide you a variety which is a requirement for your hair. Every person must choose the tool according to the hair texture and thickness. Also, remember that you must choose a perfect size of the heat styling tool based on the appearance you would like to achieve. Firstly you need to know your hair type and adjust the temperature according to it. If you have naturally dry hair or fine hair then keeps the setting at low temperature. If you have wavy, coarse or thick hair then you may be needed high temperature. Longer hair takes time to style the hair and maintaining the hair is also a long process. Many experts advise that always test a small area of hair first, and keep moving the styling tools to prevent damage. Before styling your hair, you need to learn how to perform it. We recommended that always ask your hair stylist, how to style yourself. A little professional advice never hurts. Advice suggested a new technique and shortcut which provide you a quick effect on your hair. Repeated exposures of heat or style will damage your hair permanently at a later stage. So let your hair to be naturally free for few days. This is one of the most important steps to control hair loss. If you have long or thick hair then let the hair to be dry from the air. Some experts also suggested that washing hair at night will give your hair a chance to dry and settle overnight. Hair styling tool is one of the factors for Hair loss. But hair loss generally happens due to genetics, hormones, lifestyle, and environment. 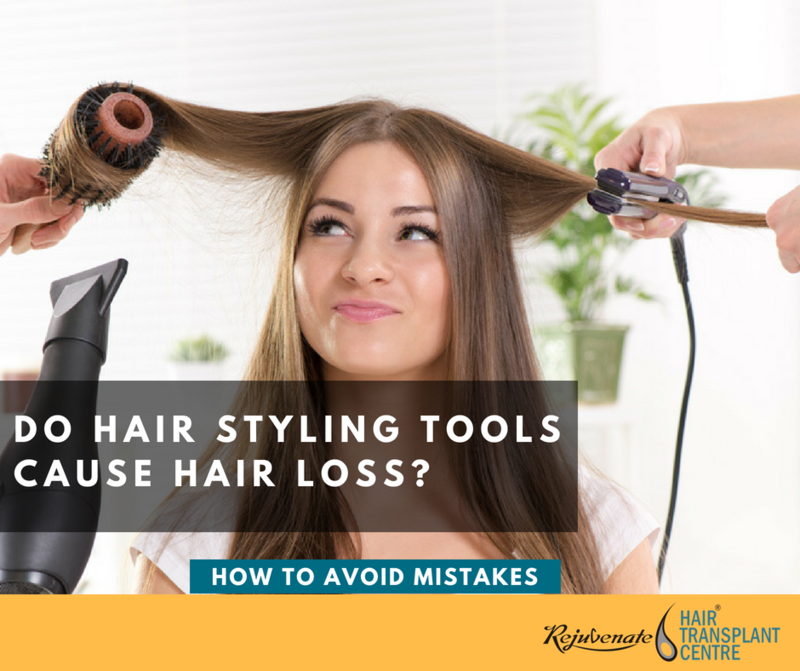 It shows that improper uses of styling tools result in hair damage. Overly use of styling weakens the hair follicles which lead to breakage of hairs from the roots. So try to use proper techniques and avoid chemicals in your hair. The natural moisture will be washed off permanently and the hair becomes dry due to Hair straightening. So, avoid the use of any tools which can hurt your hair. If you have a dry scalp and you are using hot styling tools then this could actually be a trigger for itchiness and flakes. Most people experience a dry scalp after using hot styling tools. Experts recommended that washing your hair with a shampoo or conditioner might help to avoid a dry and itchy scalp.